Infiniti just unveiled its new Infiniti LE electric sedan concept at the 2012 New York Auto Show, and Inhabitat was on the scene to get the scoop on this gorgeous new electric vehicle. The Infiniti LE features a 100 kW electric motor with 134 horsepower and 240 lb-ft. of torque, and a 24 kWh lithium-ion battery will enable it to travel up to 100 miles on a single charge. Best of all, the car will use the world’s first home wireless charging system, so drivers will be able to juice up their car without popping in the plug. Read on for more! “In a future that holds an increasing consumption of natural resources, we will advance our sustainable mobility leadership and expand our EV market penetration with new electric vehicles such as the Infiniti LE Concept,” said Nissan President and CEO Carlos Ghosn about the car. The coolest new feature of the Infinit LE concept is that it will have the world’s first built-in home wireless charging system. “All you have to do is park your vehicle over the charging pad with no need to connect cables,” stated Poore. The system’s non-contact charging is via inductive energy flow, with a coil safely encased on the garage floor. The primary coil is connected to the energy source, which then creates a magnetic field that excites electric current in a second coil in the LE concept. The LE concept also features an Intelligent Park Assist with Around View Monitor to easily align the vehicle in the proper position over the wireless charging coil. The Infiniti LE concept is about the same size as the current Infiniti G sedan,. and according to Infiniti the LE concept was designed more as a “pure” Infiniti than simply a luxury electric car. “It is first and foremost an Infiniti, born of our philosophy of Inspired Performance. Rather than taking an EV and adding an Infiniti badge, we are taking an Infiniti and removing the tailpipe,” explained Infiniti Americas Vice President Ben Poore. Infiniti chose a luxury-styled sedan body style for the LE concept rather than a hatchback design like the Nissan Leaf so that neither roominess or comfort were compromised. The LE Concept’s dramatic exterior blends distinctive Infiniti design cues, such as its double-arch grille and crescent-cut rear-pillar, with EV aerodynamic efficiency to create a sleek, emotional silhouette. The concept’s exterior shape was designed to maximize its aerodynamic efficiency, but doesn’t necessarily scream that it’s an electric vehicle. It achieves a low coefficient of drag of 0.25 thanks to aluminum-alloy wheels with aero treatment, a high rear deck, rear aero diffuser and aero side fin spoilers with integrated illumination. Just as Infiniti sought to design an electric car with an emphasis on performance, its electric powertrain will be impressive without sacrificing range. The LE concept’s 100 kW electric motor has 134 horsepower and 240 lb-ft. of torque to give it the acceleration it needs for merging onto freeways and changing lanes. The LE Concept’s electric motor gets its power from a 24 kWh lithium-ion battery that gives the concept an estimated 100-mile range. A good few years ago, my wife designed a light that charged via induction charging and she said it was an extremely inefficient method of charging something. If that's still true, then it seems strange to me to waste energy in this way just because people can't be bothered to plug in a plug. 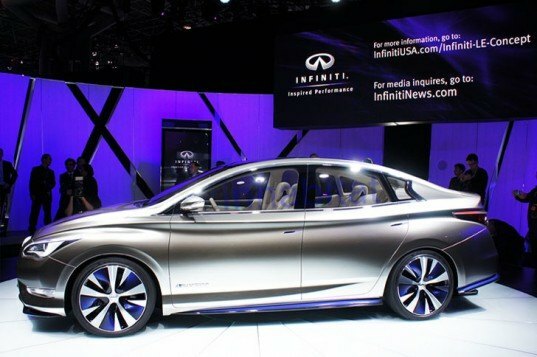 Infiniti has just taken the wraps off of its Infiniti LE electric sedan concept at the 2012 New York Auto Show, and we were on the scence to get the scoop. The LE is a preview of the production version that is expected to reach showrooms within the next two years, and we were especially excited to find out that the car will use the world's first home wireless charging system. The Infiniti LE concept borrows styling elements from previous Infiniti concepts, but this time the overall design of the concept is closer to a model that can actually be produced. According to Infiniti it's about 85 percent accurate to the production model. Infiniti just unveiled its new Infiniti LE electric sedan concept at the 2012 New York Auto Show, and Inhabitat was on the scene to get the scoop on this gorgeous new electric vehicle. The Infiniti LE features a 100 kW electric motor with 134 horsepower and 240 lb-ft. of torque, and a 24 kWh lithium-ion battery will enable it to travel up to 100 miles on a single charge. Best of all, the car will use the world's first home wireless charging system, so drivers will be able to juice up their car without popping in the plug. Read on for more! 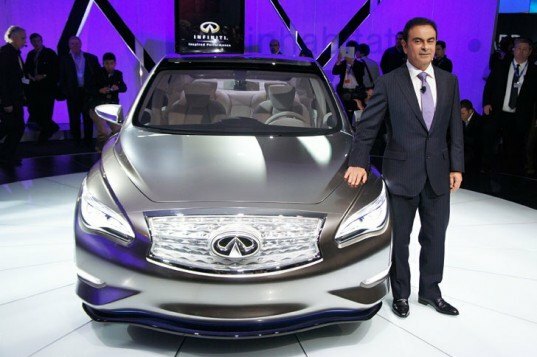 "In a future that holds an increasing consumption of natural resources, we will advance our sustainable mobility leadership and expand our EV market penetration with new electric vehicles such as the Infiniti LE Concept," said Nissan President and CEO Carlos Ghosn about the car. The coolest new feature of the LE concept is that it will have the world's first built-in home wireless charging system. "All you have to do is park your vehicle over the charging pad with no need to connect cables," stated Poore. The system's non-contact charging is via inductive energy flow, with a coil safely encased on the garage floor. The primary coil is connected to the energy source, which then creates a magnetic field that excites electric current in a second coil in the LE concept. The LE concept also features an Intelligent Park Assist with Around View Monitor to easily align the vehicle in the proper position over the wireless charging coil. 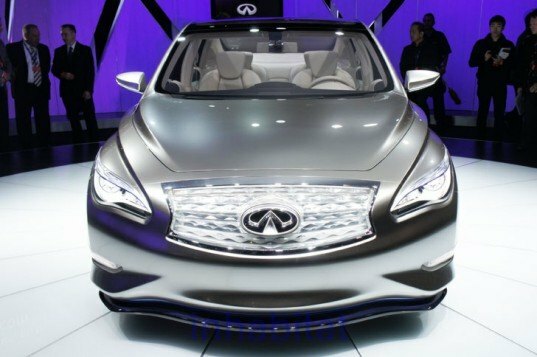 The Infiniti LE concept is about the same size as the current Infiniti G sedan and according to Infiniti the LE concept was designed more as a "pure" Infiniti than simply a luxury electric car. "It is first and foremost an Infiniti, born of our philosophy of Inspired Performance. Rather than taking an EV and adding an Infiniti badge, we are taking an Infiniti and removing the tailpipe," explained Infiniti Americas Vice President Ben Poore. Infiniti chose a luxury-styled sedan body style for the LE concept rather than a hatchback design like the Nissan Leaf so that neither roominess or comfort were compromised. The LE Concept’s dramatic exterior blends distinctive Infiniti design cues, such as its double-arch grille and crescent-cut rear-pillar, with EV aerodynamic efficiency to create a sleek, emotional silhouette. The concept's exterior shape was designed to maximize its aerodynamic efficiency, but doesn't necessarily scream that it's an electric vehicle. It achieves a low coefficient of drag of 0.25 thanks to aluminum-alloy wheels with aero treatment, a high rear deck, rear aero diffuser and aero side fin spoilers with integrated illumination. Just as Infiniti sought to design an electric car with an emphasis on performance, its electric powertrain will be impressive without sacrificing range. The LE concept's 100 kW electric motor has 134 horsepower and 240 lb-ft. of torque to give it the acceleration it needs for merging onto freeways and changing lanes. The LE Concept's electric motor gets its power from a 24kWh lithium-ion battery that gives the concept an estimated 100-mile range.